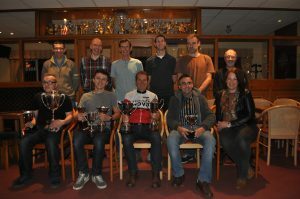 The Beech House Dental Practice TT League Prize presentations took place last week. The Women’s title saw a new winner, with Nova’s Corinne Mitchell taking the Women’s veteran’s title for the second consecutive year but this time also taking the overall women’s title with seven wins in the best of nine series, from Sarah Cave in second. The men’s veteran’s and overall title was won for the third consecutive year with maximum points by Nova’s Duncan Mullier ahead of the junior title winner, for the second consecutive year, Prologue’s Dylan Flesher. Mike Hudson took the over 50s title, Tony Kent the Over 60s and Walter Wilkinson the over 70s. The most Improved rider title was won by Nova’s Harry Wrightson, who the most improved competition seven times. In cyclocross heavy overnight rain and showers in the morning left the course for round 5 of the Yorkshire Points series at New College in Huddersfield badly cut up. Off camber banks and short ramps between the football pitches in the ground of the school became runs rather than rides for the majority. The two sand pits courtesy of the long jump area were new experiences for several the riders who were unsure how to ride the obstacle, some electing to run and other using skill and power to force their way through the energy sapping material. Nova riders, Tim Evans and Charlie Warren were riding the Vets race with David Morris riding in the senior’s race at 12:15. Nick Barnes (Hargroves Cycles-Ridley) took a comfortable win to boost his tally in the league. The 22-year-old from Leeds finished a minute ahead of the second place rider. Chris Young (Pedal Sport) took the Vet 50 race, with Marie Jackson (Paul Milnes) winning the Women’s race. Bioracer Onimpex’s Hannah Saville took second, a great result for the 18-year-old from Sheffield.